I recently lost my best friend of 28 years. She was diagnosed with stage four colon cancer with Peritoneal Carcinomatosis on Halloween morning of 2017. On Valentine's Day this year, she was admitted to the University of Michigan Hospital and two weeks later to Angela Hospice. As I held her hand, she took her last breath in the late afternoon of February 28th. At the time of her diagnoses, we were a family making a transition from one community to another, from our home of fifty plus years in California to our new home that has embraced us the past few months here in Michigan. We’ve been donating to the Orangewood Foundation in Orange, California for going on 25 years . It's an amazing institution that provides relief and guidance to children from troubled homes. We are also donating to Detroit Catholic Central High school here in Novi, Michigan. It’s a private institution where our son, Dylan, attends high school and plays hockey. There are no words to share at how grateful we are for the support that they, Dylan’s hockey teammates and the hockey parents have given to us the past few months . They are truly a brotherhood. We want for nothing . Helen and I planned for our future beyond her or my passing. Dylan and I are in a good place. People have reached out to ask how they can help. We would be grateful that in her passing, Helen would inspire a generosity that we could share with others and that --we hope-- will make someone else’s life a little better. All funds generated through this site will be evenly donated to these two worthwhile institutions. Thank you to all of those that have shared your thoughts and prayers via tweets, texts, emails and greeting cards. They have all been well received and extremely helpful in guiding us through the difficult journey that we’ve been on. Generation X, Steampunk , X-Men, Dr. Strange or Spider-Man, we’d be grateful for any contribution that that you could share in her memory. She was born on the first day of spring in 1961 and was raised in Los Angeles. Her childhood was a brief stay as her mother passed away when she was thirteen, her sister six months later and her father when she was sixteen--she was forced to grow up very quickly. She experienced a brief period of being homeless but found refuge with her brother’s family and took comfort in helping raise her nephews and niece, whom she’d loved dearly. She often said that they saved her life. I met her in the fall of 1988, we married in 1991 and we’re grateful to have lived a full life together. We ate tagliatelle in a street café in Florence, strolled the Van Gogh corridors of the Musee d’Orsay, took in the view from the Swiss Alps at Interlaken, had bangers and mash in London, was served a heart warming dinner on a chilly Inverness, Scotland evening by a man wearing a kilt, rode the Tully river in Cairns, slept in an Irish castle, went spelunking in New Zealand, sipped wine in the Val de Loire during a french winter, attended movie premieres and once had a meeting with Stan Lee. She’d tell you that her favorite place to visit was Paris--she loved speaking French. She was always at ease with people and was rarely impressed. As an Executive Assistant with the CEO of Broadcom she took calls from Steve Jobs, Meg Whitman, Roger Staubach, Tiger Wood's “people” and Larry Ellison. She once was asked by her boss to stall for time with the vice president of Taiwan. She went on a date with an Air Force officer that flew her down to San Diego in a private jet for dinner and ended the relationship before it started when he ordered dinner for her. When her boss was indicted for securities fraud by the Fed she was interviewed by the FBI. She thought that it was the coolest thing ever when they arrived at our front door displaying their badges -- but was slightly disappointed to learn that they weren’t “packing heat”. When her boss' hockey team won the NHL championship in 2007 she was tasked with watching the Stanley Cup for an afternoon. Her only take away from the experience was that the “Keeper of the Cup” had no sense of humor. She openly disliked school and often skipped classes but maintained straight A’s and was accepted into UCLA. Due to her family circumstances she was unable to attend. I often asked her what she was doing with a simple, emotionally compromised person such as myself and she’d always reply that I was the most honest person that she ever met. I trusted her, she made me laugh and most of all she was a fiercely protective mother to our son Dylan, our pride and joy. She was an amazing cook. A few years back I was shopping for a Christmas present for her and noted a placard featuring Lucy Van Pelt from Peanuts with a chef’s hat and holding a spoon. 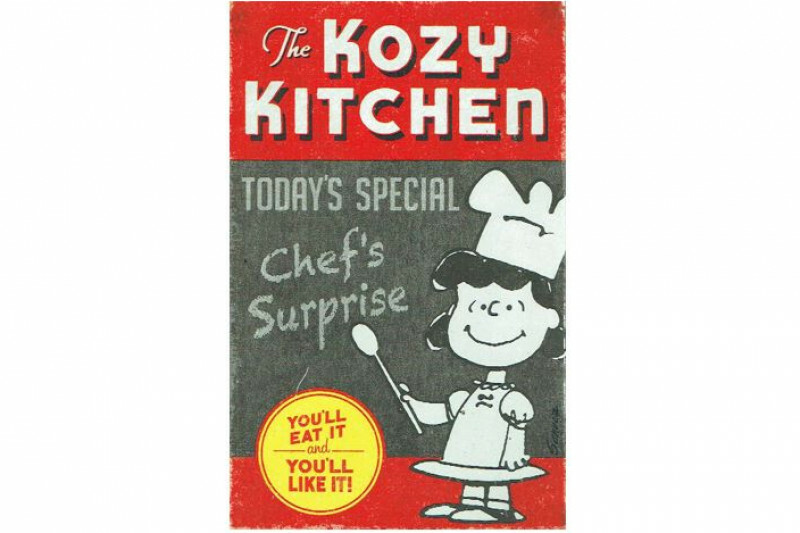 It read—The Kozy Kitchen. Today's Special--“Chef’s Surprise”. You’ll eat it and you’ll like it! For those of us that knew her, you totally get it—there was a lot of Lucy in her and I was her Schroeder. It's proudly displayed in our kitchen. She was an introvert at heart and was often perfectly content to watch Die Hard, the JJ Abrams’ Star Trek movies, binge watch Supernatural, Monk or Psych or Game of Thrones and sip on a glass of champagne. The friends she did keep were always of the highest character, extremely kind and enjoyed laughing. Her favorite thing to do in the whole world was go to Disneyland.